It's time for another girls with guns post, just in time for summer. What's not to love about the two best things in the world? Girls and Guns! The only word that accurately describes the .470 Nitro Express cartridge is "MASSIVE". It's a round made for big game hunting, the biggest game. I'm talking Rhino's and Elephants, that sort of thing. 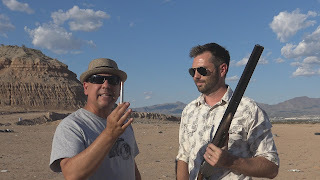 So when J. Scott Drake of Drake Fine Sporting Arms of El Paso called me up asking if I wanted to make a video of him test firing one, well, I had no choice but to change the plans I had made for the day and go along for the ride. He had recently done some gunsmithing work on a Searcy double barrel hunting rifle and needed to test fire it. The Searcy is a unique and expensive hunting rifle (costing upwards of 10 grand) and is made for big game hunters. The kind of hunters that spend lavishly on African hunting safaris. We were only out at the range for an hour or so. And at a whopping 7 dollars per cartridge, Scott only put 4 rounds down range. After all, this was just a test firing. But we also have some fun shooting whatever else we had on hand including a 100 year old Winchester 1894 30-30 that also needed to be test fired. Not knowing if the rifle would blow up in his hands, Scott fired it one handed, with a combat media standing by with a first aid kit. Fortunately, all went well with the test firing and the medic was not needed. Felix Mena and J. Scott Drake showing the .470 Nitro Express cartridge and the Searcy double barrel hunting rifle.